Love Dinosaurs? Looking for a realistic representation of Dinosaurs, but not too scary? Then this pattern is for you. It is the perfect balance between realistically hand drawn dinosaurs that are colorful, but not scary and not cartoonish. This is made up of 12 different hand drawn dinosaurs (Triceratops, Tyrannosaurus Rex, Velociraptor, Brachiosaurus, Ankylosaurus, Pterodactyl, Stegosaurus, Saurolophus, Plesiosaurus, Allosaurus, Iguanodon and Ichthyosaurus) and each dinosaur has it's type written next to it. 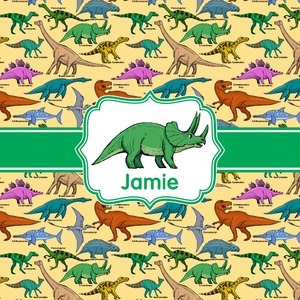 We chose a light yellow background with a green ribbon and decorative label; and we chose to use a triceratops and a name inside the label.